Toshiba introduces the world's fastest class of CF memory cards with latest Video Performance Guarantee Profile 2 (VPG-65) for high-end DSLR cameras. 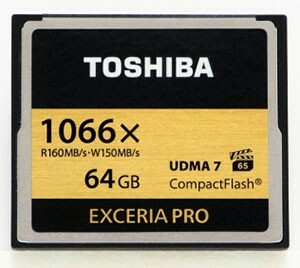 TOKYO--(BUSINESS WIRE) -Toshiba Corporation today announced that its new line of high performance CompactFlash® (CF) memory cards1, the EXCERIA PRO™ series2, will go on sale from April 27th in the Japanese market. Sales will also follow in Asia, Europe and North America. The initial line-up of 16GB, 32GB and 64GB cards offers the world's highest level read and write speeds3 and complies with the new Video Performance Guarantee Profile 2 (VPG-65) standard. The EXCERIA PRO™ CF cards integrate Toshiba's high performance NAND flash memory and specially developed dedicated firmware. They achieve a read speed of 160MB/s and write speed of 150MB/s4, the highest level yet reported. The new cards are compliant with the CompactFlash Association (CFA) standard CompactFlash® Specification Revision 6.1 and compatible with the UDMA7 high speed interface, ensuring they can support high performance DSLRs to the full. The cards are also compatible with the latest "Video Performance Guarantee Profile 2" standard, VPG-65. VPG-65 secures Full HD video capture streams at a minimum write speed of 65MB/s for compatible host devices and recording media. VPG-65 enables 4K resolution (a digital movie file format with horizontal resolution of approx. 4,000 pixels and vertical resolution of approx. 2,000 pixels) movie shooting and high quality Full HD video capture at high frame rates with no dropped frames. The market for DSLR is expected to grow by some 50% from 2012 to 2015 and demand for CF cards will grow with it. Toshiba will be developing high performance memory cards to meet those needs of the market.